Hanna got to unveil that “big deal” — a 65 centimetre by 84 centimetre limestone sculpture called Sedna — on the Hill yesterday, nine months after the House of Commons commissioned him to create the sculpture as part of the Canada 150 celebrations and to mark the 20th anniversary of Nunavut becoming a territory. 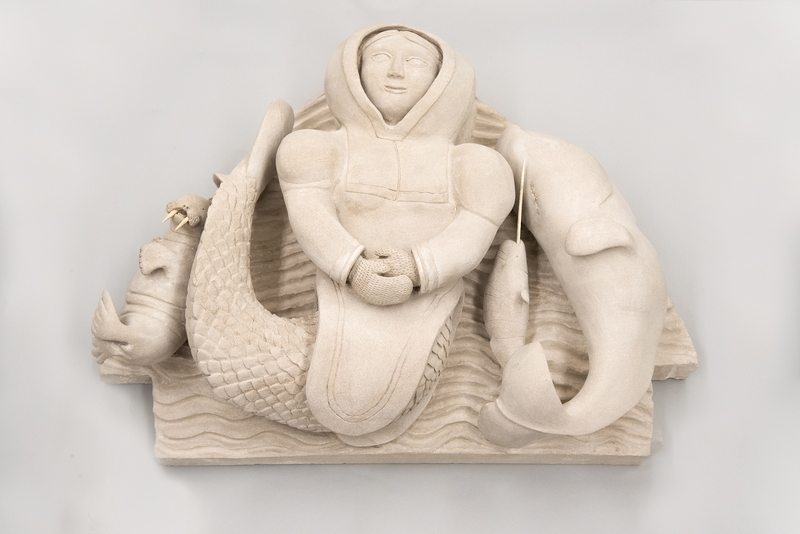 The sculpture depicts the Inuit sea goddess Sedna and can be seen in the West Block until the decade-long restoration of Centre Block is complete. When that happens, Sedna will find a permanent home in one of the most ornate and decorated spaces on Parliament Hill. Here, Hanna discusses the inspiration behind Sedna, what drives him to create art and more. This piece is special because she’s the provider of marine mammals — beluga whales, walruses, seals — and she controls the ocean. When we go hunting, if we catch anything from the ocean, we have to share it with the people. If we do, Sedna will be happy and everything will go well. If we don’t, well… it’s like a law, you know? You shall not kill. The Bible says you shouldn't do this and you shouldn’t do that, and in a similar way, Sedna protects the animals. You cannot be cruel to the animals because then she will not be happy. I don’t have too many stories, but I know stories, and the story of Sedna is one that’s well-known by my people, and I guess that’s why I made this sculpture. I usually work with harder stone, which takes longer to sculpt. But Sedna is limestone, which is softer and didn’t take as long. But it was still a lot of work — four months, at least. I kept at it every day, getting up early in the morning and going to my workshop in Igloolik, Nunavut, where I’m based. I started watching my father carve when I was five or six years old. I learned a lot from him. When the DEW [Distant Early Warning] Line came to the North in the 1950s, DEW Line people — probably Americans, but I don’t remember — wanted my father to make a little kayak, and I remember watching him carve it. And when I was 15, I went to Toronto to be treated for tuberculosis. There were other Inuit there being treated for TB and a lot of them were carving, and that’s when I really started getting interested in it. I knew it was going there, and it was a big deal for me. I’m honoured and proud to know that my granddaughters and grandsons and relatives will be able to see it, even though I probably won’t be around. That makes me very happy.